West Nusa Tenggara is a province of Indonesia. It comprises the western portion of the Lesser Sunda Islands, with the exception of Bali which is its own province. Mataram, on Lombok, is the capital and largest city of the province. The 2010 census recorded the population at 4,496,855; the latest estimate is 4,702,389. The province's area is 19,708.79 km2. The two largest islands in the province are Lombok in the west and the larger Sumbawa island in the east. The islands of Flores and Sumba are part of East Nusa Tenggara. Bali is a province of Indonesia and the westernmost of the Lesser Sunda Islands. Located east of Java and west of Lombok, the province includes the island of Bali and a few smaller neighbouring islands, notably Nusa Penida, Nusa Lembongan, and Nusa Ceningan. The provincial capital, Denpasar, is the most populous city in the Lesser Sunda Islands and the second largest, after Makassar, in Eastern Indonesia. Bali is the only Hindu-majority province in Indonesia, with 83.5% of the population adhering to Balinese Hinduism. Sumbawa is an Indonesian island, located in the middle of the Lesser Sunda Islands chain, with Lombok to the west, Flores to the east, and Sumba further to the southeast. It is part of the province of West Nusa Tenggara, but there are presently steps being taken by the Indonesian government to turn the island into a separate province. Traditionally the island is known as the source of sappanwood, as well as honey and sandalwood. Its savanna-like climate and vast grasslands are used to breed horses and cattle and to hunt deer. The Gili Islands are an archipelago of three small islands or Gili island triplets — Gili Trawangan, Gili Meno and Gili Air — just off the northwest coast of Lombok, Indonesia. Mataram is the capital of the Indonesian province of West Nusa Tenggara. The city is surrounded on all the landward sides by West Lombok Regency and lies on the western side of the island of Lombok, Indonesia. It is also the largest city of the province, and had a population of 402,296 at the 2010 Census; the latest official estimate is 420,941. A 75 carat diamond on exhibit at the Museum Volkenkunde, Leiden. It was taken, together with 230 kg (507 lb) of gold, 7,000 kg (15,432 lb) of silver and three chests of jewels and precious stones from the royal palace of Lombok after a Dutch invasion in 1894. Only part of the treasure was handed back to Indonesia in 1977. Other than the Babad Lombok document which records the 1257 Samalas eruption, little is known about Lombok before the seventeenth century. Before this time it was made up of numerous competing and feuding petty states each of which were presided over by a Sasak 'prince'. This disunity was taken advantage of by the neighbouring Balinese who took control of western Lombok in the early seventeenth century. The Makassarese meanwhile invaded eastern Lombok from their colonies in neighbouring Sumbawa. The Dutch had first visited Lombok in 1674 and the Dutch East India Company concluded its first treaty with the Sasak Princess of Lombok. The Balinese had managed to take over the whole island by 1750, but Balinese infighting resulted in the island being split into four feuding Balinese kingdoms. In 1838, the Mataram kingdom brought its rivals under control. During one of the many Sasak peasant rebellions against the Balinese, Sasak chiefs sent envoys to the Dutch in Bali and invited them to rule Lombok. In June 1894, the governor general of the Dutch East Indies, Van der Wijck, signed a treaty with Sasak rebels in eastern Lombok. He sent a large army to Lombok and the Balinese raja capitulated to Dutch demands. (see Dutch intervention in Lombok) The younger princes however overruled the raja and attacked and routed the Dutch. The Dutch counterattacked overrunning Mataram and the raja surrendered. The entire island was annexed to the Netherlands East Indies in 1895. The Dutch ruled over Lombok's 500,000 people with a force of no more than 250 by cultivating the support of the Balinese and Sasak aristocracy. The Dutch are remembered in Lombok as liberators from Balinese hegemony. Following the cessation of hostilities the Japanese forces occupying Indonesia were withdrawn and Lombok returned temporarily to Dutch control. Following the subsequent Indonesian independence from the Dutch, the Balinese and Sasak aristocracy continued to dominate Lombok. In 1958, the island was incorporated into the province of West Nusa Tenggara with Mataram becoming the provincial capital. Mass killings of communists occurred across the island following the abortive coup attempt in Jakarta and Central Java. During President Suharto's New Order administration (1967–1998), Lombok experienced a degree of stability and development but not to the extent of the boom and wealth in Java and Bali. Crop failures led to famine in 1966 and food shortages in 1973. The national government's transmigrasi program moved a lot of people out of Lombok. The 1980s saw external developers and speculators instigate a nascent tourism boom although local's share of earnings was limited. Indonesia's political and economic crises of the late 1990s hit Lombok hard. In January 2000, riots broke out across Mataram with Christians and ethnic Chinese the main victims, with alleged agents provocateur from outside Lombok. Tourism slumped, but in recent years has seen a renewed growth. To the east of Lombok lies the Alas Strait, a narrow body of water separating the island of Lombok from the nearby island of Sumbawa. The highlands of Lombok are forest-clad and mostly undeveloped. The lowlands are highly cultivated. Rice, soybeans, coffee, tobacco, cotton, cinnamon, cacao, cloves, cassava, corn, coconuts, copra, bananas and vanilla are the major crops grown in the fertile soils of the island. The southern part of the island is fertile but drier, especially toward the southern coastline. The island's inhabitants are 85% Sasak, whose origins are thought to have migrated from Java in the first millennium BC. Other residents include an estimated 10–15% Balinese, with the small remainder being Tionghoa-peranakan, Javanese, Sumbawa and Arab Indonesians. The oldest mosque dating from 1634 in Bayan. Buddhist Temple near Tanjung on the north coast. The history of a small Arab community in Lombok has history dating back to early settlement by traders from Yemen. The community is still evident mainly in Ampenan, the old Port of Mataram. Due to the siting of a UNHCR refugee centre in Lombok some refugees from middle eastern countries have intermarried with Lombok people[ citation needed ]. Many of the visitors to Lombok and much of the islands goods come across the Lombok Strait by sea or air links from Bali. Only 40 kilometres (25 mi) separate the two islands. Lombok is often marketed as "an unspoiled Bali," or "Bali's sister island." With support from the central government, Lombok and Sumbawa are being developed as Indonesia's second destination for international and domestic tourism. [ citation needed ] Lombok has retained a more natural, uncrowded and undeveloped environment, which attract travelers who come for its relaxed pace and the opportunity to explore the island's unspoiled natural environment. [ citation needed ] The more contemporary marketing campaigns for Lombok/Sumbawa seek to differentiate from Bali and promote the island of Lombok as a standalone destination. The opening of the Lombok International Airport on 1 October 2011 assisted in this endeavor. Nusa Tenggara Barat and Lombok may be considered economically depressed by First World standards and a large majority of the population live in poverty. Still, the island is fertile, has sufficient rainfall in most areas for agriculture, and possesses a variety of climate zones. Consequently, food in abundant quantity and variety is available inexpensively at local farmer's markets, though locals still suffer from famine due to drought and subsistence farming. A family of 4 can eat rice, vegetables, and fruit for as little as US$0.50. Even though a family's income may be as small as US$1.00 per day from fishing or farming, many families are able to live a contented and productive life on a low income. However, the people of Lombok are coming under increasing pressure from rising food and fuel prices. Access to housing, education and health services remains difficult for many of the island's indigenous population although public education is free throughout the province and elementary schools are tried to be present in even remote areas. Tourism is an important source of income on Lombok. The most developed tourism area of the island is on the west coast of the island and is centered about the township of Senggigi. The immediate surrounds of the township contain the most developed tourism facilities. The west coast coastal tourism strip is spread along a 30 kilometres (19 miles) strip following the coastal road north from Mataram and the old airport at Ampenan. The principal tourism area extends to Tanjung in the northwest at the foot of Mount Rinjani and includes the Sire and Medana Peninsulas and the highly popular Gili Islands lying immediately offshore. These three small islands are most commonly accessed by boat from Bangsal near Pemenang, Teluk Nare a little to the south, or from further south at Senggigi and Mangsit beach. Many hotels and resorts offer accommodations ranging from budget to luxurious. Recently direct fast boat services have been running from Bali making a direct connection to the Gili islands. Although rapidly changing in character, the Gili islands still provide both a lay-back backpacker's retreat and a high-class resort destination. Other tourist destinations include Mount Rinjani, Gili Bidara, Gili Lawang, Narmada Park and Mayura Park and Kuta (distinctly different from Kuta, Bali). Sekotong, in southwest Lombok, is popular for its numerous and diverse scuba diving locations. The Kuta area is also famous for its largely deserted, white sand beaches. The Smalltown is rapidly developing since the opening of the International airport in Praya. Increasing amounts of surfers from around the globe come here seeking out perfect surf and the slow and rustic feel of Lombok. South Lombok surfing is considered some of the best in the world. Large polar lows push up through the Indian Ocean directing long range, high period swell from as far south as Heard Island from late March through to September or later. This coincided with the dry season and South-East trade winds that blow like clockwork. Lombok is famous for its diversity of breaks, which includes world-renowned Desert Point at Banko Banko in the southwest of the island. The northern west coast near Tanjung has many new upmarket hotel and villa developments centered about the Sire and Medana peninsular nearby to the Gili islands and a new boating marina at Medana Bay. These new developments complement the already existing five-star resorts and a large golf course already established there. Tourist development started in the mid-1980s when Lombok attracted attention as an 'unspoiled' alternative to Bali. Initially, low budget bungalows proliferated at places like the Gili islands and Kuta, Lombok on the South Coast. These tourist accommodations were largely owned by and operated by local business entrepreneurs. Areas in proximity to the airport, places like Senggigi, experienced rampant land speculation for prime beachfront land by big businesses from outside Lombok. In the 1990s the national government in Jakarta began to take an active role in planning for and promoting Lombok's tourism. Private organizations like the Bali Tourism Development Corporation (BTDC) and the Lombok Tourism Development Corporation (LTDC) were formed. LTDC prepared detailed land use plans with maps and areas zoned for tourist facilities. Large hotels provide primary employment for the local population. Ancillary business, ranging from restaurants to art shops have been started by local businessmen. These businesses provide secondary employment for local residents. The 1997 Asian Financial Crisis and the fall of Suharto regime in 1998 marked the beginning a decade of setbacks for tourism. Spurred by rapid devaluation of the currency and the transition to true democracy caused all of Indonesia to experience a period of domestic unrest. Many of Indonesian Provinces struggled with elements of the population desiring autonomy or independence from the Republic of Indonesia. At the same time, fanatical Islamic terrorism in Indonesia further aggravated domestic unrest across the archipelago. In January 2000, radical Islamic agitators from the newly formed Jemaah Islamiyah provoked religious and ethnic violence in the Ampenan area of Mataram and the southern area of Senggigi. Many foreign expatriates and tourists were temporarily evacuated to Bali. Numerous foreign embassies issued Travel Warnings advising of the potential danger of traveling to Indonesia. Subsequently, the 2002 Bali bombings, the 2005 Bali bombings and the Progress of the SARS outbreak in Asia all dramatically impacted tourism activities in Lombok. Tourism was slow to return to Lombok, provoked in part by a worldwide reluctance to travel because of global tensions. Only since 2007–2008, when most developed countries lifted their Travel Warnings  has tourism recovered to pre-2000 levels. The years leading up to 2010 has seen a rapid revival and promotion of tourism recovery in the tourism industry. The number of visitors has far surpassed pre-2000 levels. All signs indicate the long-term trend will see a steady increase in the number of visitor arrivals. Lombok retains the allure of an undeveloped and natural environment. Tourism visits to this tropical island are increasing again as both international and local tourists are re-discovering the charms of Lombok. With this new interest comes the development of a number of boutique resorts on the island providing quality accommodation, food, and drinks in near proximity to the relatively unspoiled countryside. The Indonesian government is actively promoting both Lombok and neighboring Sumbawa as Indonesia's number two tourist destination after Bali. Then–President of Indonesia, Susilo Bambang Yudhoyono, Ministry of Cultural and Tourism and the regional Governor had made public statements supporting the development of Lombok as a tourism destination and setting a goal of 1 million visitors annually by the year 2012 for the combined destination of Lombok and Sumbawa. This has seen infrastructure improvements to the island including road upgrades and the construction of a much delayed new International airport in the islands south. Bali Tourism Development Corporation (BTDC) has been empowered to develop Mandalika Resort Area at southern part of the island, extending from Kuta along 8 kilometers of sandy beach. Despite this, Sumbawa retains a very rustic feel compared to Lombok. Lombok International Airport (Bandara Internasional Lombok) ( IATA : LOP, ICAO : WADL) is south west of the small regional city of Praya in South central Lombok. It commenced operations on 1 October 2011. It replaced Selaparang airport near Ampenan. It is the only operational international airport within the province of West Nusa Tenggara (Nusa Tenggara Barat). Selaparang Airport in Ampenan was closed for operations on the evening of 30 September 2011. It previously provided facilities for domestic services to Java, Bali, and Sumbawa and international services to Singapore to Kuala Lumpur via Surabaya and Jakarta. It was the island's original airport and is situated on Jalan Adi Sucipto on the north western outskirts of Mataram. The terminals and basic airport infrastructure remain intact but it is closed to all civil airline traffic. Lembar Harbor seaport in the southwest has shipping facilities and a ferry for road vehicles and passenger services. In 2013, the gross tonnage is 4.3 million Gross Tonnages or increase by 72 percent from 2012 data means in Lombok and West Nusa Tenggara the economy progress significantly. Labuhan Lombok ferry port on the east coast provides a ferry for road vehicles and passenger services to Poto Tano on Sumbawa. Pelni Shipping Line provides a national network of passenger ship services throughout the Indonesian archipelago. Pelni have offices in Ampenan. Flights from Ngurah Rai International Airport ( IATA : DPS) to Lombok International Airport ( IATA : LOP) take about 40 minutes. Lombok international airport is located in southwest Lombok, 1.5 hours drive to Senggigi main tourist areas in the west Lombok, 2 hours drive to the jetty of Teluk Nara before you cross to Gili Islands and about 30 minutes drive to Kuta south Lombok. Public Ferries depart from Padang Bai (Southeast Bali) and Lembar (Southwest Lombok) every two hours, taking a minimum of 4–5 hours make the crossing in either direction. Fastboat services are available from various departure points on Bali and principally serve the Gili Islands, with some significant onward traffic to the Lombok mainland. Arrival points on Lombok are dependent upon the operator, at either Teluk Nare/Teluk Kodek, Bangsal harbour or the township of Senggigi, all on the northwest coast. Operating standards vary widely. ↑ "Lombok Island & West Nusa Tenggara Demography & Gender Ratio (Based on BPS 2014 Census)". MarlionLLC. 19 August 2017. Archived from the original on 2017-08-19. Retrieved 19 August 2017. ↑ "15 Things You Should Visit in Lombok". 2015. Retrieved June 6, 2015. ↑ "Population of Indonesia by Province". Badan Pusat Statistik Republik Indonesia (Statistics Indonesia). 2010. Archived from the original on 22 August 2017. Retrieved 7 February 2011. ↑ Thomas Brinkhoff (18 February 2012). "INDONESIA: Urban City Population". City Population. Thomas Brinkhoff. Retrieved 16 August 2012. ↑ Liputan6.com. 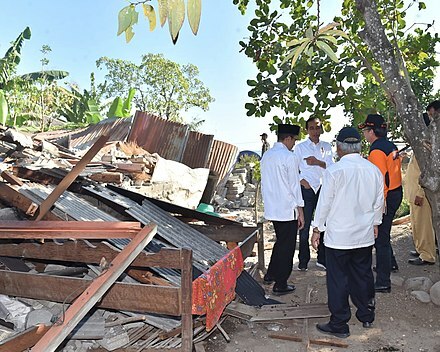 "Korban Jiwa Gempa Lombok Bertambah Jadi 20 Orang". liputan6.com. Retrieved 2018-08-05. ↑ "Asia Pacific: Multiple disasters affect millions in the region". ReliefWeb. Retrieved 2 August 2018. ↑ Lamb, Kate (6 August 2018). "Indonesia earthquake: at least 91 dead after quake strikes Lombok and Bali". The Guardian. London. Retrieved 6 August 2018. ↑ Dr George Beccaloni; Charles Smith (2012). "Other things named after Wallace". The Alfred Russel Wallace Website. Dr George Beccaloni. Retrieved 16 August 2012. ↑ "The world's biomes". Ucmp.berkeley.edu. Retrieved 2010-10-06. ↑ "Source of massive volcanic eruption found in Indonesia". USA Today. September 30, 2013. Retrieved 19 October 2013. ↑ "NTB Akan Alami Krisis Air Bersih". Viva.co.id. May 20, 2009. Archived from the original on 2010-11-22. Retrieved 6 May 2009. ↑ Fitri R (8 September 2010). "Water Everywhere, but Not a Drop to Drink". Jakarta Globe online. Retrieved 9 September 2010. ↑ Bestbeach., Ltd (2012). "Geography of Lombok". Lombok's Guide. Bestbeach., Ltd. Retrieved 16 August 2012. ↑ "By Regency / Municipality in West Nusa Tenggara Year 2008". Badan Pusat Statistik Provinsi Nusa Tenggara Barat (Central Bureau of Statistics West Nusa Tenggara Province). December 11, 2009. Archived from the original on 2017-08-21. Retrieved 30 August 2010. ↑ "Religion by Location". Adherents.com. Retrieved 2010-10-06. ↑ "From Ancestor Worship to Monotheism, by Sven Cederroth, Politics of Religion in Lombok". NB this article is not currently available from previous URL source (Aug 2010). Temenos 32 (1996), 7–36. 1996. Archived from the original (acrobat pdf) on 2001-12-01. Retrieved 2005-06-13. 1 2 3 4 "From Ancestor Worship to Monotheism, by Sven Cederroth, Politics of Religion in Lombok". NB this article is not currently available from previous URL source (Aug 2010). Temenos 32 (1996), 7–36. 1996. Archived from the original (acrobat pdf) on 2001-12-01. Retrieved 2005-06-13. ↑ Weiner, Eric (2008-09-21). "Next Stop – Lombok Island, Indonesia – Living in Bali's Shadow, but Maybe Not for Long – NYTimes.com". Indonesia: Travel.nytimes.com. Retrieved 2010-04-04. ↑ Source: Adapted from National Social Economic Survey (SUSENAS) (December 11, 2009). "Poverty Line, Number and Percentage of Poor People in West Nusa Tenggara Province in March 2008 – March 2009". Badan Pusat Statistik Provinsi Nusa Tenggara Barat (Central Bureau of Statistics West Nusa Tenggara Province). Archived from the original on 2017-08-21. ↑ Source: Adapted from National Social Economic Survey (SUSENAS) (December 11, 2009). "Percentage of Population Aged 10 Years and Over and Marital Status 2008In West Nusa Tenggara Province in March 2008 – March 2009". Badan Pusat Statistik Provinsi Nusa Tenggara Barat (Central Bureau of Statistics West Nusa Tenggara Province). Archived from the original on 2017-08-21. ↑ "Asia-Pacific | Analysis: Indonesia's fragile archipelago". BBC News. 2000-09-13. Retrieved 2010-04-04. ↑ "U.S. lifts Indonesia travel warning". Usatoday.Com. 2008-05-25. Retrieved 2010-04-04. ↑ "President gives full support to tourism". The Jakarta Post, Senggigi, West. Nusa Tenggara, Panca Nugraha, The Archipelago. 2009-07-07. Retrieved 2009-07-08. ↑ "Lombok, Sumbawa eying 1 million tourists by 2012". MissJoaquim. 2017-08-19. Retrieved 2017-08-19. ↑ Sertori, Trisha (2009-06-07). "An invitation from Lombok". The Jakarta Post. Retrieved 2009-07-07. ↑ "schedules of Pelni ships / Pelayaran Nasional Indonesia". pelni.com. Retrieved 2010-10-06. The Sasak people live mainly on the island of Lombok, Indonesia, numbering around 3.6 million. They are related to the Balinese in language and ancestry, although the Sasak are predominantly Muslim while the Balinese are Hindu. Sasak people who practice pre-Islamic beliefs are also known as Sasak Boda in reference to the name of the Sasak people's original religion, Bodha. The Lombok Times is an English language newspaper which was founded in 2003 as an information medium for the growing English language speaking community, which consists of both visiting tourists and foreign expatriates in the Indonesian provinces of West Nusa Tenggara and Bali. The Bali–Sasak–Sumbawa languages are a group of closely related languages spoken in the western Lesser Sunda Islands. The three languages are Balinese on Bali, Sasak on Lombok, and Sumbawa on western Sumbawa. West Lombok Regency is a regency of the Indonesian Province of West Nusa Tenggara. It is located on the island of Lombok and the capital is Gerung. East Lombok Regency is a regency of the Indonesian Province of West Nusa Tenggara. It is located on the island of Lombok and the capital is Selong. Central Lombok Regency is a regency of the Indonesian Province of West Nusa Tenggara. It is located on the island of Lombok and the capital is Praya. It covers an area of 1,208.39 km2, and had a population of 859,309 at the 2010 Census; the latest official estimate is 898,855. North Lombok Regency is a Regency of the Indonesian Province of West Nusa Tenggara. It is located on the island of Lombok and the capital is Tanjung situated on the north coast of the island. 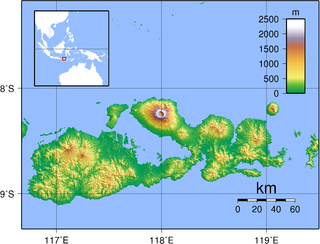 West Sumbawa Regency is a Regency (Kabupaten) of the Indonesian Province of West Nusa Tenggara. It is located on the island of Sumbawa and has an area of 1,636.95 km2. The population at the 2010 Census was 114,754, but the latest official estimate is 120,115. The capital is Taliwang. Praya is the capital town of Central Lombok Regency on Lombok Island in the province of West Nusa Tenggara, Indonesia. It has an area of 31.12 square kilometres (12.02 sq mi) and a population of 55,041 people at the 2010 Census. It is a predominantly Muslim town, with minorities of Balinese inhabitants following Hinduism and Chinese inhabitants following Buddhism or Christianity. The Dutch intervention in Lombok and Karangasem took place in 1894, and is part of the string of Dutch interventions in and around Bali, Dutch East Indies, that led to complete colonization of both Bali and Lombok by the early 20th century. Zainuddin Abdul Madjid International Airport previously known as Lombok International Airport, is an airport on the island of Lombok in Indonesia. It is the island's only fully operational airport. West Nusa Tenggara State Museum is a state museum located in Mataram, Lombok Island, Indonesia. The museum is the provincial museum of the West Nusa Tenggara province. Belanting is a village in northeastern Lombok, Indonesia. It lies along the main road around the island, southeast of Obel Obel and northwest of Sambelia. It belongs administratively to the kecamatan of Sambelia in East Lombok Regency, West Nusa Tenggara. As of 2010, the village had a population of 6610 people. The islands of Sulat Island and Lawang Island of the Sungian Strait just off the coast can be viewed from the village. A Pujungan Inscription, also called Bronze Tongtong Inscription, is a short inscription written on a copper slit drum, which was found in the village of Pujungan in Pupuan District, Tabanan Regency, Bali, Indonesia. This inscription is thought to have been written during the reign of King Anak Wungsu in the 11th century. This is the first inscription that mentions the name Sasak, the name of the indigenous people of Lombok island. L, Klemen (1999–2000). "Forgotten Campaign: The Dutch East Indies Campaign 1941-1942". Archived from the original on 2011-07-26. Wikimedia Commons has media related to Lombok . Wikivoyage has a travel guide for Lombok .